In France, rutabaga is known as a "forgotten vegetable," as the hardy root veggie fell out of fashion following World War II, when locals consumed far too much of it! Today, however, it's coming back into vogue, and it's not hard to see why. Slightly sweet and earthy, rutabaga is a delicious side dish veggie. To top it all off, it's far lower in carbs than potatoes or sweet potatoes, making the recipe below the perfect low-carb stand in for fries. For this recipe, duck fat is your friend. Toss the sliced rutabagas in a liberal amount of duck fat, and then set them in a hot oven. They'll crisp up and caramelize, becoming even sweeter and more tender. Serve them with a side of homemade mayonnaise for the perfect low-carb side. Toss the rutabaga with the duck fat and salt, and arrange in an even layer on a baking sheet. Roast for 30 minutes, tossing after about 15 minutes to ensure even browning. 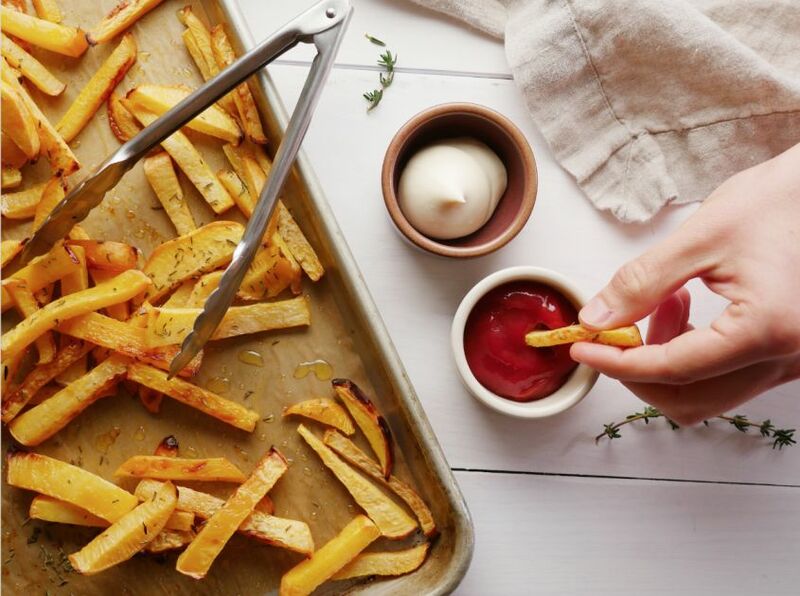 When the fries are cooked, toss them with the thyme and serve.